Identifying drop metastases to the spine from pediatric brain tumors is crucial to treatment and prognosis.MRI is currently the gold standard for identifying drop metastases, more sensitive than CSF cytology, but imaging is not uncommonly inconclusive. Although diffusion-weighted imaging (DWI) of the brain is very useful in the evaluation of hypercellular tumors, DWI of the spine has not been clinically useful in children because of susceptibility artifacts and lack of spatial resolution. A new technique, readout-segmented echo planar imaging (EPI),has improved these images, allowing for identification ofhypercellular drop metastases. 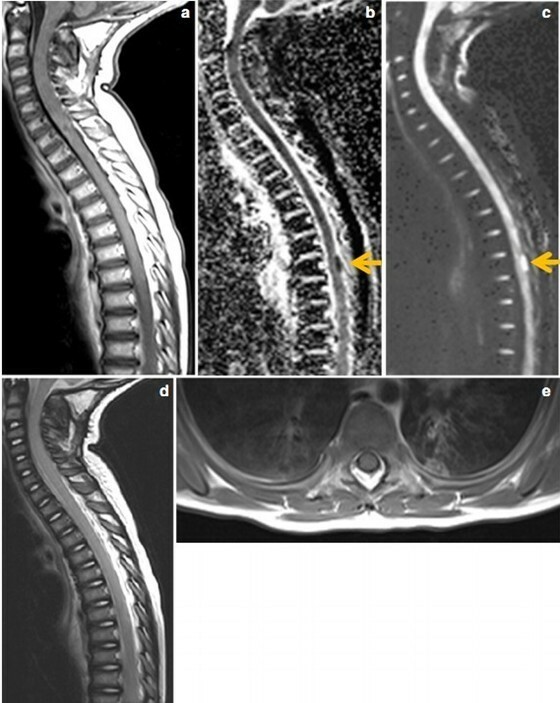 We report a case thatillustrates the utility of spine DWI in the detection ofmetastatic disease in children with primary central nervoussystem (CNS) tumors. This case suggests that DWI of thespine with readout-segmented EPI should be included in theevaluation for drop metastases. Diffusion-weighted imaging (DWI) of the spine revealsdrop metastases (that might not be visible on conventionalsequences in children with hypercellular brain tumors). 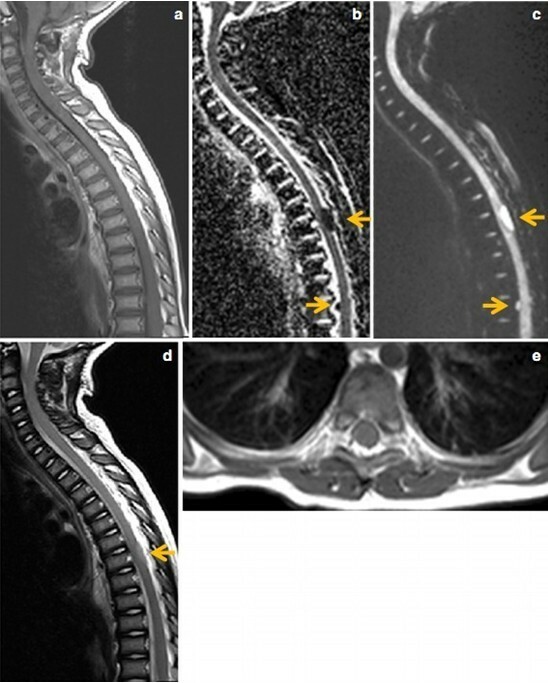 Wereport a case that illustrates the utility of spine DWI in thedetection of CSF-disseminated metastases in children withprimary central nervous system (CNS) tumors. IRB approval was obtained for this report. A 2-year-old girlwith an atypical teratoid rhabdoid tumor (ATRT) of theposterior fossa presented for a routine follow-up MRI scanof the brain and spine. At the time of diagnosis, her primarytumor demonstrated restricted diffusion on MR andheterogeneous enhancement with gadolinium. She had noevidence of drop metastases to the spine. Subsequently, sheunderwent gross total resection, and was treated withintrathecal and intravenous chemotherapy in addition toposterior fossa radiation. She was negative for residualdisease for 16 months. She was off treatment for 3 monthsand asymptomatic with negative CSF cytology at the timeof the follow-up study. Her MRI scan, performed on a 1.5-TAvanto system (Siemens Medical Systems, Erlangen,Germany), revealed a single nodular focus of restricteddiffusion along the dorsal aspect of the spinal cord in the mid-thoracic region (Fig. 1). There was no correspondingsignal abnormality or abnormal enhancement at thislocation. Because of the diffusion abnormality, a conservative approach of short-interval follow-up imaging in 8 weekswas taken. 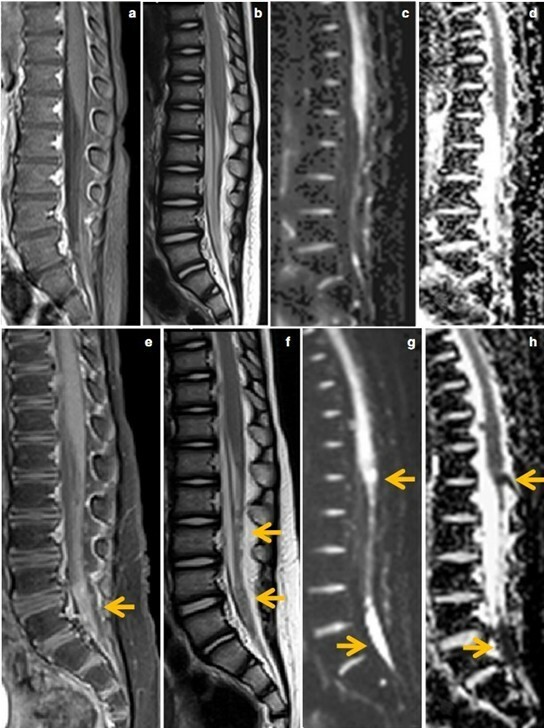 The next MRI scan of the spine performedon the same scanner revealed an interval increase insize of the previously visualized nodular diffusionabnormality and new, extensive drop metastases, bestvisualized on the DWI sequences. Many of the dropmetastases were now apparent on the conventional T2-W and post-contrast T1-W sequences (Figs. 2 and 3).Her brain MRI remained negative without evidence forrecurrent intracranial tumor.